鸟瞰洪都拉斯：被米奇飓风破坏的村庄，Originating south of Jamaica, Hurricane Mitchreached winds of 180 miles (288 km) per hour four days beforestriking Central America on October 26, 1998. 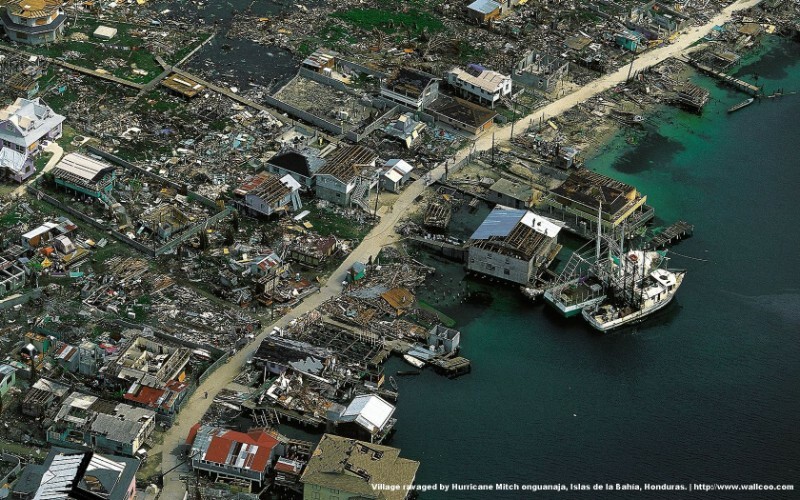 Honduras, includingthe island of Guanaja, was battered for two days by destructivewinds, torrential rains, and mudslides that wiped out entiretowns, killing several thousand people and leaving more than 1million injured or homeless. During the months following thedisaster, the population also endured a shortage of drinking waterand an outbreak of disease. Mitch, the most severe hurricane tostrike Honduras since Fifi (in 1973), also destroyed 70 percent ofthe banana and coffee crops, the country’s major exportproducts, bringing economic chaos to a country that is alreadyamong the world’s poorest.